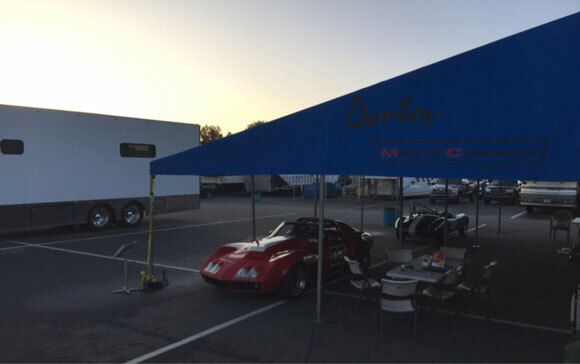 Every year the Duntov team has put VIR on the schedule but this year was the first time we actual made it, but it won’t be the last. What a fantastic racetrack, and what a beautiful facility. There is not a straight section on the track more than a few hundred yards long. The straightaways defy their designation. It is a serious track for serious road racers, and it is especially challenging for big-bore production cars that typically don’t like rapid direction changes at high speeds. 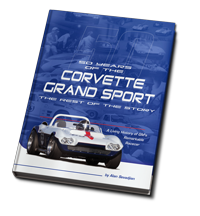 The Duntov crew consisted of the father and son team of Alan and Edward Sevadjian taking care of Susie Patterson’s Devin MG and Tony Parella’s 1972 small block Corvette. 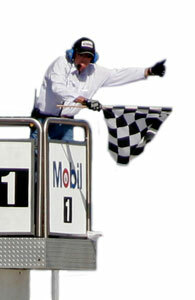 Tony knew he wouldn’t have time to get in much more than a practice session or two and then hopefully run the enduro. There was a lot going on and Tony’s time at the races is always short. Tony drove one session on Thursday and almost a third of a lap on Friday. During the out lap of Friday’s first practice session, Tony got rammed by a red Mustang. It was a hard hit, and we were fortunate to have installed a heavy chrome moly bumper that protected the fuel cell. 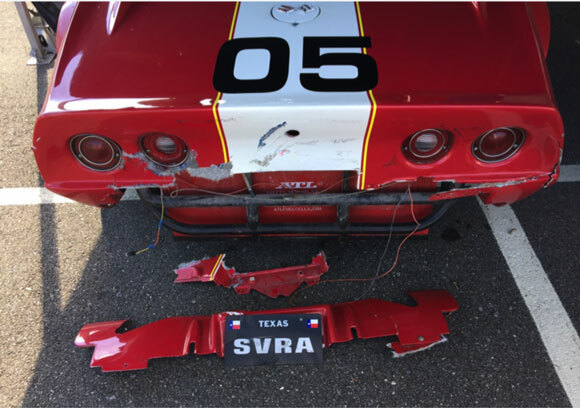 The impact destroyed the tail light section of the fiberglass body and both dented and bent in the .120 wall inch-and-a-half fuel cell protective frame. On the list of bone-head moves you can make on a racetrack, smashing into another car on the out lap of the first practice session has to be pretty near the top. Fortunately that almost never happens in SVRA racing. Trackside repairs were made and Edward took the car out in the next session to make sure everything else was OK, and it was. 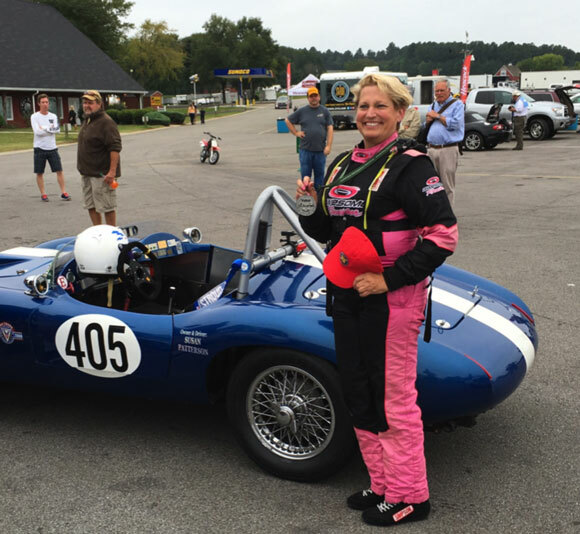 Susie Patterson had raced at Coronado Island the weekend before, only 2533 miles west of VIR. Her car ran OK at Coronado, but had a major low RPM miss during the first session that had the crew busy for the rest of the day. 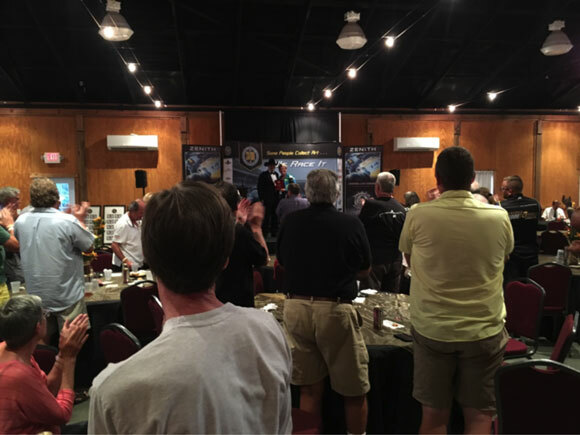 The SVRA VIR race weekend is last event of the East Coast SVRA racing season as well as the site of the annual awards banquet. The banquet was outstanding with great food, ample bar service, and a fast-paced program. The Duntov table took home a lot of trophies! Susie Patterson won the Rookie of the Year award along with the Group 4 point’s championship. Clair Schwendeman was the winner of both the Group 6 point’s championship and the Group 6 enduro point’s championship. The trophies were really nice! Susie Patterson gets a standing ovation as she is presented the Rookie of the Year Award. Sunday morning was the sixty minute “little enduro.” It had some interesting sub-plots. For one, John Koch, who ‘Pro Mechanic of the Year” at the awards banquet the night before not only got the recognition and a nice trophy, he also got to drive his bosses racecar in the enduro. In fact he started the super fast Curt Vogt Boss 302 Mustang from pole position, and did a great job. Tony started on the outside of the front row and followed Koch for a couple of laps before passing him for the lead. Tony’s lead didn’t last long, as first Travis Engen in his Lotus 23 passed him and then Bill Keith in a Porsche 911 RSR did as well. Tony ran eleven laps and brought it in for fuel and a driver’s change. Edward got in and after a 5 minute 9 second pit stop he joined the race in seventh place. In the next 15 laps Edward lowered his lap time almost every lap to eventually pass for the lead on the dirty line on the outside of the kink on the front straightaway. He went on to set the fastest Group 6 lap time of the race and of the weekend. It was a thrill to watch not only because of the clinic Edward was putting on, but because Curt Vogt had taken over the Mustang after 13 solid laps run by his mechanic, and he immediately headed for the lead as well. This was Edwards first time at VIR and only his third session on the track, so he was still learning the track as Curt was turning fast lap after fast lap trying to catch up. In only five laps Curt passed for third, and in five more laps he passed Travis Engen for second, but by this time, Edward was turning faster laps than Curt and the race was over. It was by far the race of the weekend. L-R John Koch, Curt Vogt, Tony Parella and Edward Sevadjian ? Curt not quite as happy as the others! Susie ran again in Group 4 at VIR, in class 4FM. The winning car was also in class 4FM, but it was a 1960 rear engined Elva racecar that was 40 seconds a lap faster than Susie’s 1952 MG-TD special. It seems illogical to put those two cars in the same class! 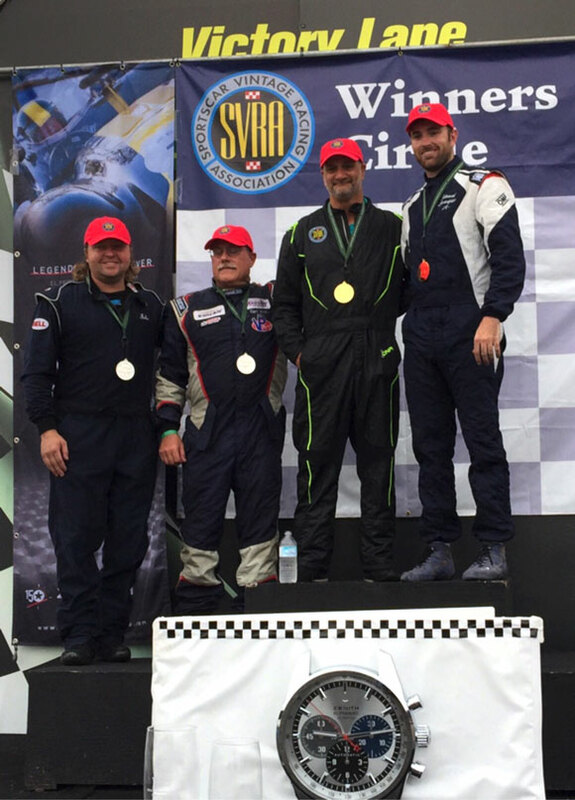 One of SVRA’s sponsors is Texas-based Royal Purple, manufacturers of a terrific line of synthetic lubricants for high-performance cars. 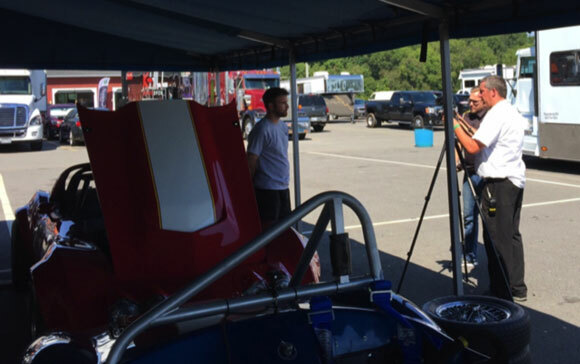 They were shooting a commercial at VIR and chose Duntov’s Edward Sevadjian and Cobra Automotive’s Curt Vogt for on camera interviews. 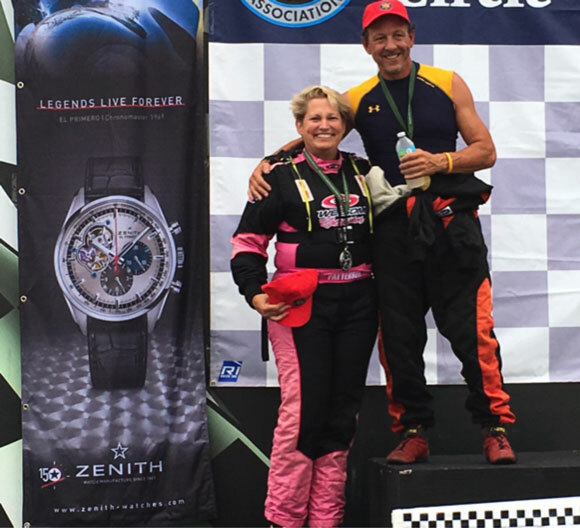 Susie Patterson with her second place silver medal after the Group 4 feature race at VIR.